The American Pasque Flower, (Pulsatilla hirsutissima,) was adopted as South Dakota's state flower on March 5, 1903. 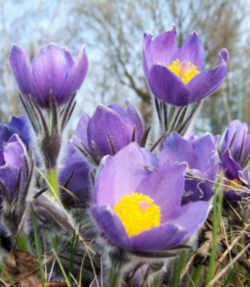 Also called the May Day flower, prairie crocus, wind flower, Easter flower and meadow anemone, the pasque is one of the first flowers to bloom in the spring (often before the late winter snows have thawed). In 1919, South Dakota's state flower law was revised, changing the scientific name to Pulsatilla hirsutissima. Originally named the Paschflower by herbalist John Gerade in 1597. From the Hebrew word Pasch, which means Passover. This perennial herb is more commonly called the pasqueflower (psk?flou? ?r) from the French word Pasque, or "Easter". It grows wild throughout the state, and its blooms are one of the first signs of spring in South Dakota. A wildflower of the prairie regions of North America, is of the buttercup family having purple, crocus like flowers blooming about Easter. 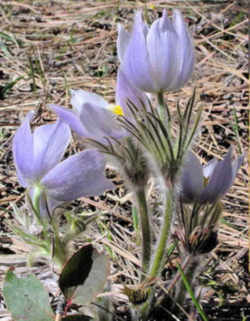 The pasque flower has often been made the subject of Plains Indian songs and legends. 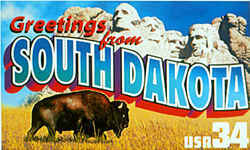 South Dakota's original state flower bill, described it as "the pasque or wind flower. "It was changed to "pasque flower," with the scientific name "Anemone patens. While many of the other plants in South Dakota haven't even turned green, the pasque flower is peaking above the snow, with its white, pink, or purplish, tulip-like blossoms already open. The flower's common name is French for Easter, and refers to the plant's habit of flowering between late March and early June, depending on location. This member of the buttercup family, the pasque is a small, lavender flower, has been given numerous names over the years: Easter flower, May Day flower, gosling flower, wild crocus, prairie crocus, prairie anemone, meadow anemone, sand flower, wind flower and prairie smoke. The scientific genus name, Anemone , means wind flower. 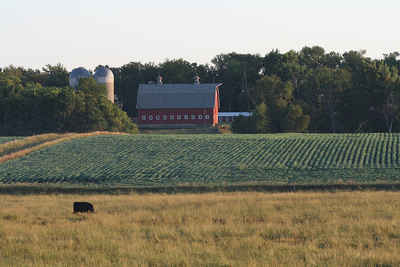 The species name, patens , means spreading. The Lakota name for this plant, "hosi' cekpa" translates as "child's navel" and is very descriptive of the plump flower buds that look like a newborn's navel before it heals. The pasque flower is found across much of North America from approximately 43 degrees to 60 degrees north latitude. It is found from Alaska, south to Utah, east to Illinois and west to Alberta. Pasque flowers prefer plains, foothills and mountain meadows at altitudes from 4,000 to 10,000 feet (1231-3077 m). In eastern South Dakota, pasque flower growth can be quite luxuriant, though it becomes more sparse west of the Missouri River. With agriculture and ranching, pasque flowers are not as abundant as they once were, but they are still locally common in the Black Hills, Slim Buttes, and Cave Hills. The law designating the American pasque flower as the official South Dakota state flower is found in the South Dakota Codified Laws, Title 1, Chapter 1-6, Section 1-6-10. TITLE 1. STATE AFFAIRS AND GOVERNMENT. 1-6-10. 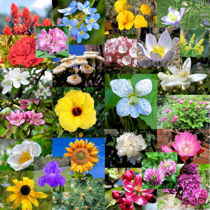 State floral emblem. The floral emblem of this state shall be the American pasque flower (pulsatilla hirsutissima) with the motto "I Lead." Source: SDC 1939, § 55.0109.